This particular bake was a redemption, after several all-sourdough Multigrain failures in a row. Having seen David, Lindy, and many other TFL bakers exhibit their wonderful 5 grain levain loaves, The recipe was on my to-do list for some time. Also, Hamelman praises the flavor of the said loaf in his "BREAD". Yesterday, I gathered some nerve to start another sourdough, this time armed with the collective wisdom thankfully shared by fellow TFL members. 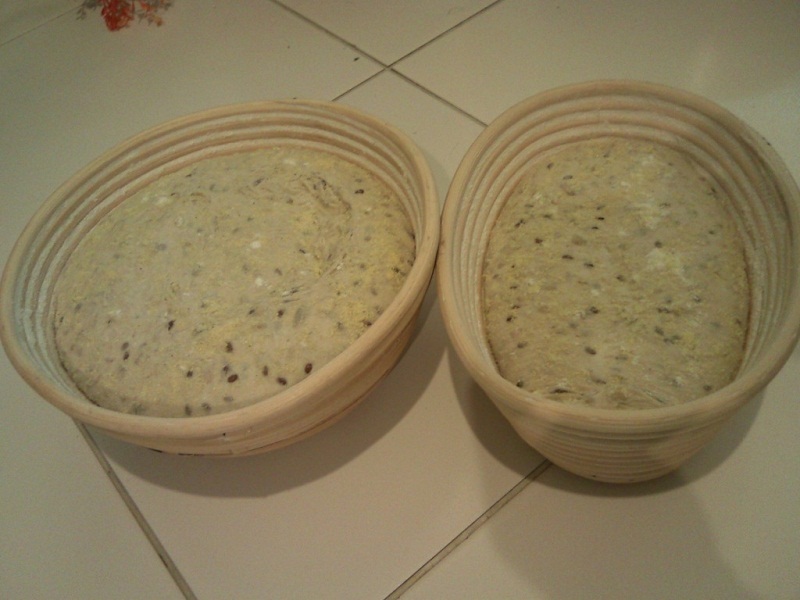 I discovered that the cause of my levain loosing vigor and character soon as it is built is because the starter culture that seeded the levain did not contain enough happy yeasts. I apparently underfed my starter or did not correctly nurture the yeast population in it, which lead to less than optimal culture, and consequently weak proteolytic levain. yesterday, i had a well fed starter and at the peak of its activity. I seeded the levain, and took it to work for observation. It peeked during my duty after 8 hours, and i had to refresh it. Eventually, the final dough was full of vigor. I chose to omit the yeast, so i retarded the dough for 10 hours at 10C. I had some slices today, and it is very light and tasty. It is only remotely acidic. i suppose it should taste better tomorrow. I believe that omitting the yeast changes the special flavor that Hamelman praises, so i'd want to try it next time with yeast. When you get it right you go all out. This bread looks both delicious and wholesome. I think you were right about a sluggish starter; I bake about every 10 days and I refresh the starter 3 times at 12 hour intervals before using. 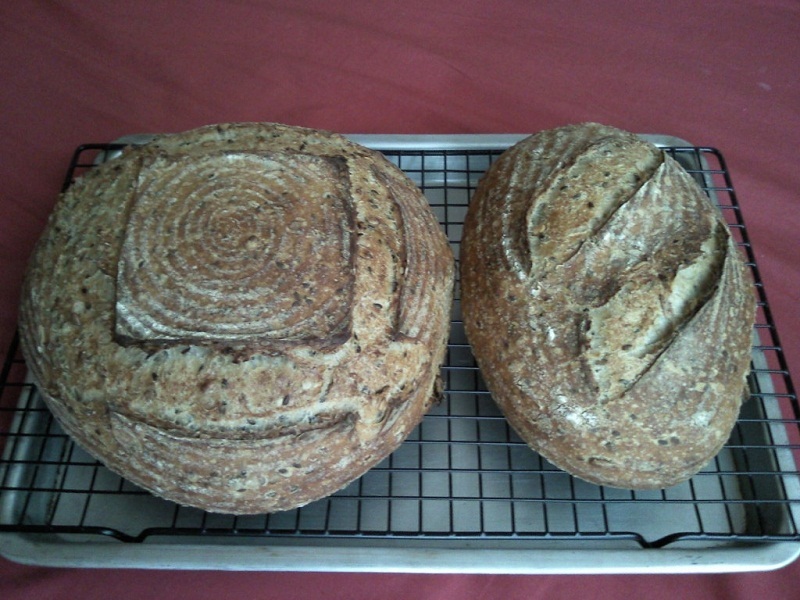 The volume and open crumb on these loaves indicate that your starter was indeed healthy and strong. I found that this bread tastes best without the added yeast and with the overnight retardation. Looks so delicious. I find with a good healthy starter there's no need for yeast and as David says the overnight retardation does add flavor. We so enjoyed the last multigrain loaf I'm making more...love the flavors. Lovely bread! And I'll bet it tastes wonderful when toasted, too. Thanks, David! I may have cut the loaves earlier than recommended for sourdoughs. The crumb was soft and pretty moist. i bet the quality of this bread shows best 24 hours or more after baking. I'll cut the other loaf tomorrow. Thanks, Sylvia! I still prefer the wholewheat multigrain to this one, but its early to decide. The smaller loaf is intentionally left uncut. Iam sure this recipe has potential to taste great! Thanks, Paul. I'll toast some tomorrow. Glad to see you figured out your starter Khalid. I never thought your loaves were ever bad to begin with! 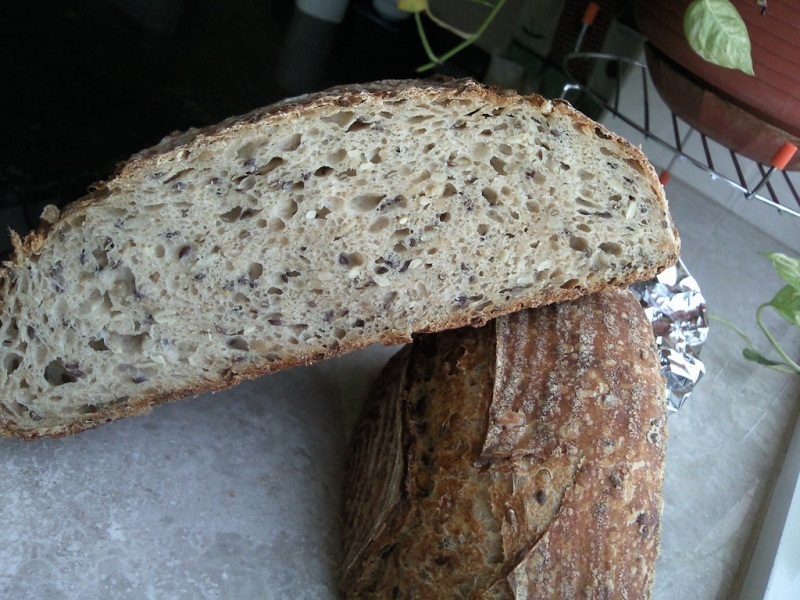 Yes, it seems there has been a bit of hype over the five grain levain from Bread. Perhaps when I leave the bakery tomorrow morning I will buy from our stock the grains needed for the bread and give it a shot. Have you tried the Pain Au Levain with Whole Wheat? I just baked that yesterday and had some this morning before work and loved it. The crumb was very creamy and delightful. Looking Good Khalid! Great crumb and crust as usual. Nice work. Gosh, Khalid, just looking at your beautiful crumb makes me salivate! A most beautiful bake, filled with good taste and great character. Thanks, Arlo! I havn't tried pain au levain with whole wheat. I shall give it a try some day. Thank you for sharing your bread = ) Will try soon. May I know where you got your baskets ( for proofing ) ? I have been searching all over been couldn't find any where I live. Have been searching for these baskets for a long time now. Can you give me the recipe for your 5 grain... I have yet to start a starter. Still confuse as to how to start one. The Recipe was posted here: by liz, a TFL member, thank you Liz. If you like sourdough breads, search in this site for Sourdolady threads, and Debrah Wink threads about starters. I believe that The infused oats play a major role in the uniqueness of this bread. It is moderately sour too. Bottom line, this bread is perfect for toasted slices. WOW, Khalid They look awesome!!! I don't have confidence to make this bread without using Instand Dry Yeast yet..But when I see your loaves, I am motivated to make it ... Another but.. I am not a big fan of soury bread. How is the taste now? Is it better? Thank you Daisy!! I understand what it means to bake inferior bread, i went through it in more than an occasion. You are so right about the starter being underfed. This whole website is such an inspiration to all of us! I learned a lot from Senior TFl members, and continue to learn from recent members.. Thank you akiko! 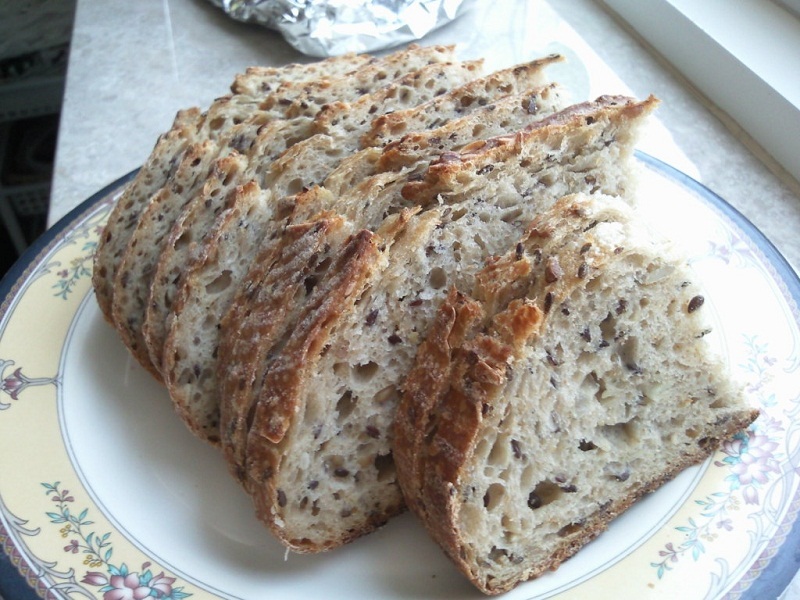 the flavor of this bread is slightly sour, due to overnight final proofing using leaven only. But once you toast a slice the sourness blends into the grain mix, and the gelatinized oates, you'll have an excellent toast which goes with any topping.